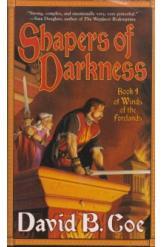 Shapers of Darkness Book 4 of Winds of the Forelands by David B Coe Sci Fi. Book in an excellent condition, all pages intact. The magic wielding Qirsi and their Eandi masters have mobilized their forces. Can they discover some way to defeat the Weaver's movement before he conquers the entire land?